Hi! I'm making an Arena Shooter Called Dungeon Smashers which is basically a clone of Smash TV. Well, it's more like a reimagining if you will. I'm also writing a tutorial series detailing how I am making this game. I've only made one other game before this which was a Yahtzee Clone for the Xbox Indie Channel, lol I guess I like making clones! But don't we all? I was going to give myself two years to finish this game, but I am thinking it might only take me a year now! 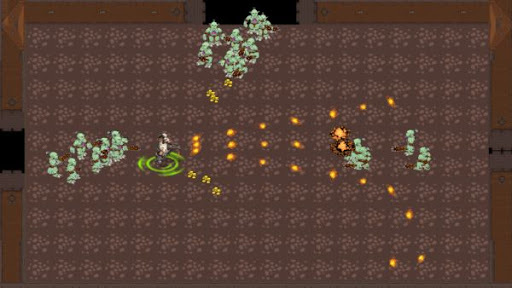 I decided that it might be fun to get some help with creating this game so I posted an ad on Gamedev for visual and audio artists. I'm also looking for another programmer who would like to help, the game is being created with TorqueX. One of the responses I got was from a soundeffects designer whose demo reel was really good so I said that would be cool if he could help. I also got in contact with the band who made the song in the video posted above and they have agreed to work on the soundtrack for Dungeon Smashers!! Pretty Sweet! Our Sound Designer asked for a playable demo to help him design the sounds so I started making a small test level with all the current weapons placed on the floor, easily picked up and used. At the moment I'm increasing the test levels functionality to make testing sounds and music easier. I decided to use this test level myself to test out concepts before incorporating them into the actual game project lol. I think this is a good thing because the way I work is a bit scattered and I tend to write and rewrite things multiple times, usually deleting stuff that I should have saved. We are still looking for a pixel artist at the moment, or someone who can turn their 3D models into 2D animated characters. If you are reading this and are interested, please get in contact. We can't offer any compensation at the moment, but everyone involved gets an equal split of all revenue from this game when its released.